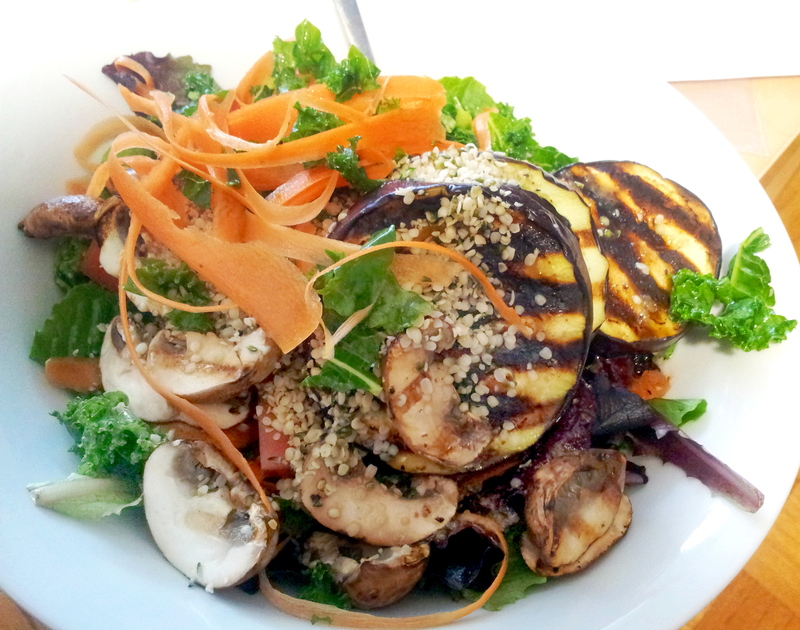 Today’s lunch consisted of baby romaine, massaged kale, carrots, tomatoes, grilled eggplant and mushrooms, hemp seeds and an oil and vinegar dressing. First up, I received an honorary mention in the Vegan MoFo Chopped Challenge! Secondly, here is what I had for dinner the other night: rice pasta and tomato sauce with some beanballs. I threw in some kidney beans, walnuts, spices, onions and some other stuff into the food processor. I brushed them with oil and baked them at 350 for about 20 minutes. This was a clean out the fridge kind of salad, so I used roasted cauliflower (chop, drizzle with oil and bake at 450) and assorted veggies. The dressing is from, where else, Fresh! I also added some marinated tofu cubes, based on Fresh’s recipe as well (tamari, apple cider vinegar, sunflower oil and some water). I got the dressing recipe from vegangela. My new blender sprays the contents of the jar everywhere, even on the lowest setting, so I wasn’t able to open the top and slowly add the oil, so I didn’t get a real emulsified dressing happening. It was still pretty tasty, though! I’m planning out my entry for the Vegan MoFo chopped event happening. I need to use popcorn, butternut squash, rosemary and apricot preserves AND make a brunch dish. Stay tuned for what I get up to! I made these gingerbread cookies for a bachelorette last weekend. The more risque ones have been hidden from view. Spinach, beets, cucumber, peppers, tomatoes, sunflower seeds, hemp hearts, sundried tomato dressing and bean salad. I baked it at 350 for about 30 minutes. I had lots of extra mashed potatoes, so I made a quick soup: vegetable broth, a carrot, 3/4s of a bunch of celery, half of an onion and a head of roasted garlic blended with mashed potatoes and some almond milk. Lunch today is canned rice and beans. Depressing. I miss vegetables already.